Asphalt 5 has been one of the top racing games for iPhone and iPod Touch, and now that Gameloft has brought Asphalt 5 HD to the iPad, fans can revel in the much larger screen and the superior view of the road. After a few laps around the track, you’ll find it very difficult returning to racing games on the iPhone’s smaller screen. Everything that gave the original Asphalt 5 lots of racing fun and replay value is here in the HD version for iPad. You can jump in for a quick race or settle into the career mode where you can unlock up to 33 cars and race through 12 different cities. Asphalt 5 offers plenty of gameplay variety, including the ability to race against AI opponents or play against friends—either locally via Bluetooth or Wifi or across the Internet. Steering options include tilt control, simple left-right button control, or an on-screen steering wheel. You can also select auto-acceleration to simplify driving if you wish. You can also drive through power-ups to recharge your nitro canisters, earn bonus money, or kits to repair damage. Fast frame-rates with detailed cars and environments were one of the strengths of the iPhone version, and that holds true in the HD version too. However, with the larger screen, the experience is much more immersive, and the details of the scenery can be fully appreciated. Additionally, the iPad’s larger size more closely approximates the width of an actual steering wheel, thereby adding to the realism. Even with the improved graphics and screen size, Asphalt 5 HD is still an arcade racer with simplified physics and controls so anyone can quickly get up to speed. But don’t think that because Asphalt 5 isn’t a realistic driving simulation, it isn’t difficult. AI drivers are relentless and very quick. You’ll need those power-ups and hold a good racing line to finish in the top three. Asphalt 5 HD is a rich arcade racing experience combining beautiful graphics, smooth control, and tons of replay value. It brings a level of fit, finish, and a multitude of options normally reserved for console titles. Asphalt 5 HD doesn’t add much to the original iPhone version, though, so if you’ve mastered that, you’ll have to decide if the larger screen is worth buying the separate version for iPad. 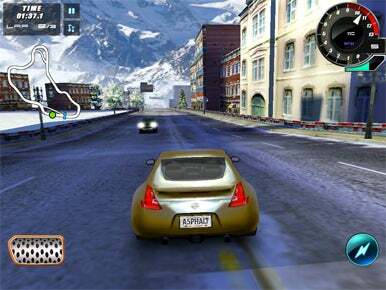 Asphalt 5 HD is compatible with an iPad running the iPhone 3.2 software or later.